The short-fingered Bedford is a lightweight, comfortable glove. Not only does it boast a sporty, modern look – bikers love this model for its fit, wear comfort and range of features as well. The backhand made from Poly Lycra makes this glove comfortable to wear and is a real eye-catcher thanks to its creative design with the color-contrasting Roeckl hand logo. The Duradero palm also feels very pleasant to the touch while remaining extremely durable. The multi-colored siliconized palm ensures a secure grip on the handlebar and emphasizes this model’s modern look. For added comfort, Roeckl Sports has equipped this glove with its patented Comfort-Innovation, the seamless padding at the crook of the thumb, as well as with ergonomic, high-quality Flex-Foam padding. It reliably protects the sensitive nerves in the palm of your hand against jolts, pressure and vibrations. 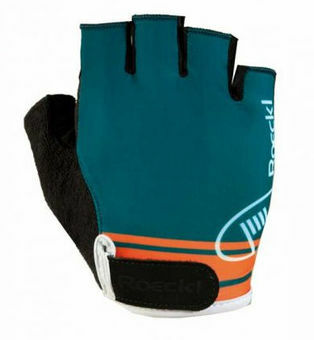 Thanks to Roeckl’s exclusive Pull Off System, taking off the gloves requires just one swift motion. This model’s comprehensive range of features is complemented by a broad terrycloth thumb.